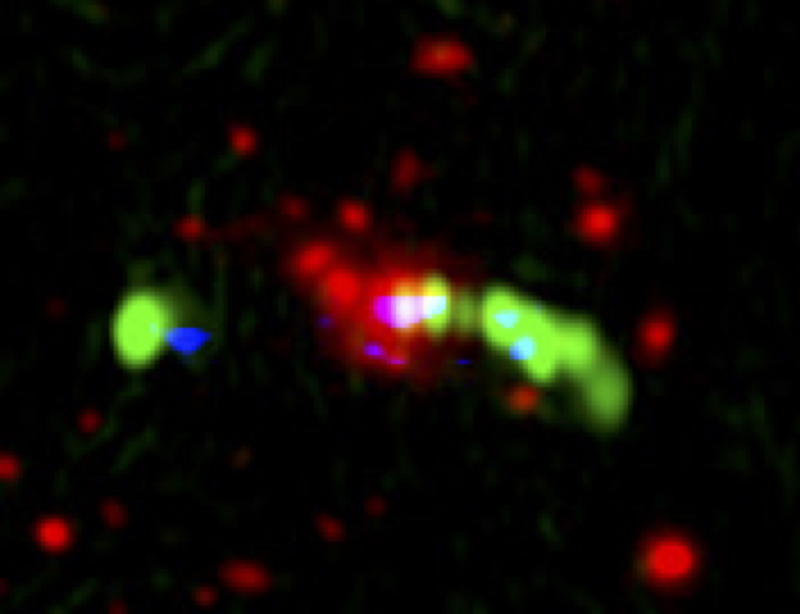 Annotated image of the Spiderweb Galaxy, as seen by the Hubble Space Telescope (optical) in red, the Very Large Array (radio) in green and the Atacama Large Millimeter/submillimeter Array (sub-millimetre) in blue. The red colour shows where the stars are located within this system of galaxies. The radio jet is shown in green, and the position of the dust and water are seen in blue. 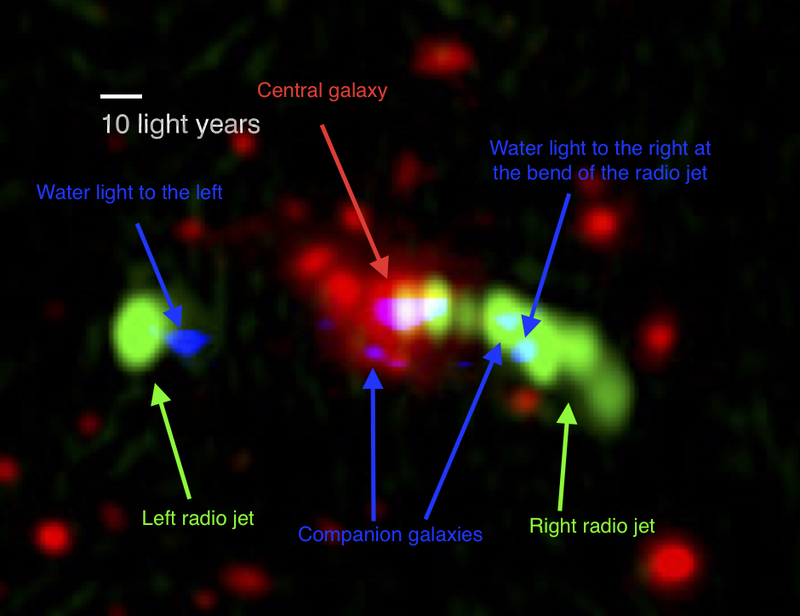 The water is located to the left and right of the central galaxy. The water to the right is at the position where the radio jet bends down wards. The dust is also seen in blue. The dust is located at the central galaxy and in smaller companion galaxies in its surroundings. Credit: NASA/ESA/HST/STScI/NRAO/ESO/Astronomers have spotted glowing droplets of condensed water in the distant Spiderweb Galaxy – but not where they expected to find them. Detections with the Atacama Large Millimeter/submillimeter Array (ALMA) show that the water is located far out in the galaxy and therefore cannot be associated with central, dusty, star-forming regions, as previously thought. The results will be presented at the National Astronomy Meeting 2016 in Nottingham by Dr Bitten Gullberg on Friday 1st July. “Observations of light emitted by water and by dust often go hand-in-hand. We usually interpret them as an insight into star-forming regions, with the illumination from young stars warming dust particles and water molecules until they start to glow. Now, thanks to the power of ALMA, we can -- for the first time -- separate out the emissions from the dust and water populations, and pinpoint their exact origins in the galaxy. The results are quite unexpected in that we’ve found that the water is located nowhere near the dusty stellar nurseries,” explained Dr Gullberg, of the Centre for Extragalactic Astronomy, Durham University, UK. The Spiderweb Galaxy is one of the most massive galaxies known. It lies 10 billion light-years away and is made up of dozens of star-forming galaxies in the process of merging together. The ALMA observations show that the light from the dust originates in the Spiderweb Galaxy itself. However, the light from the water is concentrated in two regions far to the east and west of the galaxy core. Gullberg and her colleagues believe that the explanation lies with powerful jets of radio waves that are ejected from a supermassive black hole at the centre of the Spiderweb Galaxy. The radio jets compress clouds of gas along their path and heat up water molecules contained within the clouds until they emit radiation. The University of Nottingham (http://nottingham.ac.uk/) has 43,000 students and is ‘the nearest Britain has to a truly global university, with a “distinct” approach to internationalisation, which rests on those full-scale campuses in China and Malaysia, as well as a large presence in its home city.’ (Times Good University Guide 2016). It is also one of the most popular universities in the UK among graduate employers and the winner of ‘Outstanding Support for Early Career Researchers’ at the Times Higher Education Awards 2015. It is ranked in the world’s top 75 by the QS World University Rankings 2015/16, and 8th in the UK by research power according to the Research Excellence Framework 2014. It has been voted the world’s greenest campus for four years running, according to Greenmetrics Ranking of World Universities. - In the 2016 Times and Sunday Times Good University Guide and the 2016 Complete University Guide, Durham was ranked fifth in the UK. - Durham was named as The Times and Sunday Times 'Sports University of the Year 2015' in recognition of outstanding performance in both the research and teaching of sport, and student and community participation in sport at all levels.